VietNamNet Bridge – Reducing the rice growing area in the Mekong Delta and the south has been projected by the Ministry of Agriculture and Rural Development (MARD), in a hope to help increase the rice growers’ incomes. Rice growing area down, farmers’ income up? According to Le Thanh Tung from MARD, the rice production area of the 2012-2013 winter-spring crop was 20,800 hectares higher than the previous year, while the output was 650,000 tons higher. However, since the export has been unsatisfactory, farmers’ incomes have been unstable. Chair of the Vietnam Food Association (VFA) Truong Thanh Phong said the domestic supply is profuse, while India and Thailand both have big inventories of 26 million and 15 million tons. Meanwhile, the demand from import markets, including the Philippines and Indonesia is weak. MARD, believing that the oversupply has made the farmers’ income unstable and affected the export, is considering cutting down the rice growing area to help improve farmers’ incomes. It is expected that the rice growing area in the south in 2014 would be lower by 3,260 hectares than in 2013. However, analysts do not think the rice growing area reduction would not help improve farmers’ income. “I believe that it is the market demand and supply, not the rice growing area which have influences to farmers’ income,” said Le Van Banh, Head of the Mekong Delta Rice Institute. According to Banh, the problem lies in the way of organizing the rice production. “In the long term, Vietnamese rice exporters need to learn about what countries need what varieties of rice and how much they need, and then place orders with farmers,” he said about what Vietnam should do in order to help both boost export and improve farmers’ income. Phong of VFA said that it is highly impossible to export 7.5 million tons of rice as initially planned. The food organization has lowered the predicted rice export volume in 2013 to 7.2 million tons. “Rice exporters need to export 2.5 million tons in the fourth quarter of the year, which is really a heavy task, because Vietnamese rice now has to compete fiercely with Thai and Indian,” Phong said. Also according to Phong, Africa consumed 23-24 percent of Vietnam’s total exports in the first months of the year, estimated at 4.8 million tons by September 12, 2013. However, Vietnam only has advantages in high quality and fragrant rice, while it proves to be uncompetitive with India in low cost rice, because of the high transportation fee, about $50 per ton. 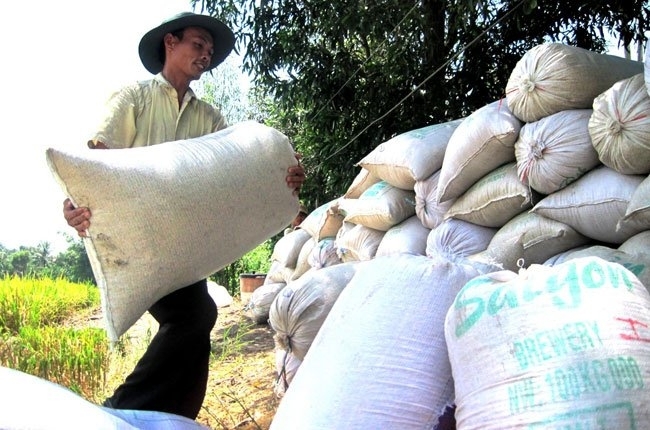 Duong Van Men, a rice merchant in Dong Thap province, who collects rice from farmers to resell to export enterprises, said fresh IR 50404 in Mekong Delta is now priced at VND4,000 per kilo, while long grain rice at VND4,300, a decrease of VND500 per kilo in comparison with earlier this year. Rice processing export companies only pay VND6,400 per kilo for IR 50404 and VND6,500 for long grain rice, which means the VND700 per kilo decrease in price compared with early August. By September 12, the fragrant rice exports had double that of the same period of the last year, accounting for 14 percent of the total export volume.